Check out this gem of a postcard from 1920, entitled: The sky is now her limit. The detail I wish was true: that we had achieved wage equality before women gained political appointments. What is true: The ratio of female notaries to males is 3 to 1 in some states. Source of the image: Library of Congress via Katie Casey on Twitter. Hi Susannah, enjoyed very much deciphering what the lady had to climb to get to notary public..and don’t be surprised, notary public is now a woman’s domain in many countries. thanks for sharing and for checking the details! Thanks, Kathi! Always great to know you’re out there, reading and giving me the international perspective. First, my own work lately has been focusing on another ladder – Arnstein’s Ladder of Citizen Participation, first published in 1969 – and its parallels with healthcare’s often muddled (but earnest) thinking about “patient engagement.” Feast a few moments on this page, and substitute “patient” etc for “citizen” etc. Example: how many early PFACs (pt & family engagement councils) have experienced this Arnstein line, quoted there? There is a critical difference between going through the empty ritual of participation and having the real power needed to affect the outcome of the process. 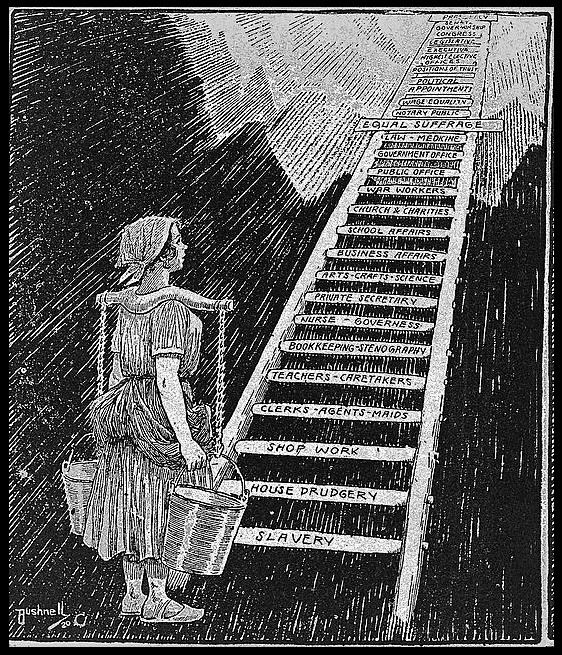 Separately, image-googling your ladder led to this cartoon of a woman singing the anti-suffrage tune from the National Women’s History Museum; it resonates with some of our recent US campaign news. Finally, featuring both the election theme and your ladder, remember the anti-suffrage flyer from 1912, which I blogged four years ago today: in the same way many docs say “My patients aren’t asking for records access,” the flyer said to vote no on suffrage because 90% of women weren’t asking for it. Running things requires many kinds of competence about how things are. Leadership requires seeing could be possible, for the greater good. LOVE all of those links and resources — thank you!